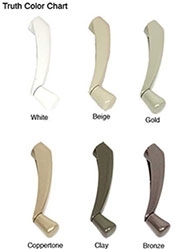 The Truth Window Handle 24.25 is one of the more popular window handles. On the older version the handle was plastic toward the end of the handle, and it would break off. The new version is metal all the way to the end. It has 2-1/2" on center mounting screws, and the mounting plate is 2-7/8" long x 5/8" wide. This Truth Casement Window Handle sometimes has the number 45200 or 45268 cast into it. And U.S. Patent Number 4.674.777. See the exact measurements in the "More Views" window.